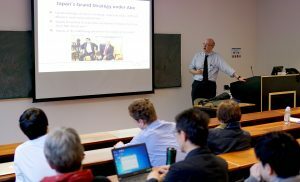 Professor Christopher Hughes, Alumnus of SEAS, gave a public seminar on the newly emerged Abe Doctrine and its implications on Japanese foreign and security policy. Christopher W. Hughes is a Professor of International Politics and Japanese Studies, and Pro-Vice-Chancellor (Education) at University of Warwick (UK). His two most recent works are a book titled: Japan’s Foreign and Security Policy under the ‘Abe Doctrine’ (2015) and a journal article on ‘Japan’s Strategic Trajectory and Collective Self-Defence: Essential Continuity or Radical Shift?’ (2017) in The Journal of Japanese Studies. The presentation aimed to answer questions concerning Abe’s doctrine such as its implication for Japanese relations in East Asia and for the US-Japan Security Alliance. He presented the question of whether the new strategy is a continuation of the past or represents a radical shift and ultimately questioning if there is any coherent strategy at all. Prime Minister Abe seeks to dismantle the Yoshida Doctrine and to be ranked alongside other developed industrial powers. The first step on this road is to escape from the ‘post-war regime’ which is a branded as a ‘regime of defeat’, especially with concern to three key issues: the occupation period, the constitution, and disputed accounts of Japanese war-time history. Japan needs to rediscover its identity and free it from constraints imposed by the Constitution and the Allied occupation. Abe’s view on these topics generated a debate whether he is a pragmatist leader or a radical one. The first group argues that while he has nationalist leaning, but his policy-making is based on pragmatic considerations. The latter argument holds that he has a ‘bait and switch’ strategy concentrating on different matters depending on how close the elections are, carefully avoiding sensitive topics around campaign and election periods focusing on economic and domestic policies instead; and his doctrine is – indeed – radical and ambitious both in intent, articulation and impact. Its intent is to leave behind the foreign and security policy regime of a ‘defeated power’ and restoration of Japan’s international status and autonomy. To achieve this, three areas were targeted: constitutional restraints on use of military force, the US-Japan Alliance, and the diplomatic approach to East Asia. Breaking with the previously low military profile and mercantile doctrine Japan should increase its international presence, and its military should be freed from constraints. Instead of avoiding security obligations and fearing entrapment Japan needs to build a stronger alliance and more equal partnership with the US. In East Asia, Japan should adopt political and economic leadership emphasising values such as the rule of law, free market economics and human rights; which is a clearly and attempt to balance against China through value-oriented diplomacy thus abandoning its former strategy to engage China in regionalisation process. The impact so far has been quite mixed. The shift from individual to collective self-defence and the revision of the US-Japan Defence Guidelines has radically changed the security dimension of Japan. However, there are quite few setbacks on other areas such as the US backing out of the Trans-Pacific Partnership and the mixed reception of its efforts in East Asia. The relationship with South Korea is strained because of the unresolved comfort women issue. With regards to North Korea, the abduction cases, nuclear and missile tests has reversed any previous progress for a more amicable relationship. There is a continued stalemate in the Sino-Japanese relations ever since the early 2000’s. ASEAN is evenly split between favouring Japan or China; where maritime states are more worried about China, hence, more willing to align themselves with Japan. This hedging creates – as a member of audience highlighted  a very similar situation to the Cold War, although Prime Minister Abe’s aim is to win the region over instead of dividing it up. In summary, the Abe Doctrine is ideologically driven and quite flawed. However, it is also true that coupled with the Yoshida Doctrine these are Japan’s best attempts to establish a grand strategy. Its success is hindered by three paradoxes. First while in East Asia Abe aims to keep the status quo by the promotion of universal and liberal values, his quest for a more assertive security policy makes him a revisionist, at least in the view of several neighbouring nations. Secondly, the endeavour to close the chapter on war-time Japan – while diminishing the atrocities committed by the Japanese military – reinvigorates the debate with the neighbours and prolongs the conflicts of the past. Finally, he seeks strategic independence and an autonomous Japan by ironically increasing its dependence on the US. But Abe and the LDP successfully wedged open the door for collective self-defence which can no longer be closed, just opened wider as Professor Hughes concluded both at the end of the seminar and in his article.